For each trick, each player plays 2 cards, one at a time, taking Suit Actions for each card played. The playing of 2 cards per player per trick allows for some very strategic play, since a player can set up their hand to get the most out of both card plays in each trick. Chad and Mike are playing. Mike deals and after passing cards, Chad leads the first card. Chad plays the 4 of Diamonds, and Mike follows suit by playing the 3 of Diamonds. Into this same trick, Chad plays another card, and since he is out of Diamonds, he plays a Heart, and takes the Heart Suit Action. Also, into this same trick, Mike plays the 8 of Diamonds. Mike wins the trick, and takes the Diamonds Suit Action. Mike begins the next trick by leading a card. Play continues in this manner. Partners sit opposite each other across the table. The Dealer decides how many cards will be passed, but cards are passed between partners. There should be no communication between partners about the number or type of cards to pass. Each partnership uses one Vault and one Showroom. At the end of a Round, combine the cards taken by each partner to determine End of Round Suit Actions awarded. If a player takes no tricks, they get the two Diamond Suit Actions, even if their partner took tricks. For 5 players: Use all 60 cards in the deck. Deal 12 cards to each player per Round. For 4 players: Remove all 14s and 15s from the deck. Deal 13 cards to each player per Round. For 3 players: Remove cards numbered 10 to 15 from the deck. Deal 12 cards to each player per Round. For 2 players: Remove cards numbered 9 to 15 from the deck. Deal 16 cards to each player per Round. Removed cards are placed back in the box and not used during the game. Use this altered deck to play all Rounds of the game. All other rules remain the same. 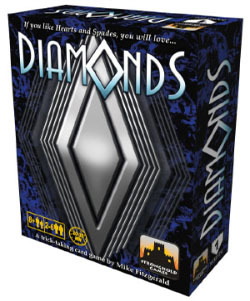 This variant provides players with perfect knowledge of the cards that are in play during the game.